Y’all don’t even KNOW how excited I am to see this warm weather roll in. It’s going to be in the high 70s all week and I couldn’t be happier! I realized that I haven’t posted any style posts in a white and the truth is I just haven’t been all that inspired. I needed a season change to reboot and now I am ready to go! Add that to the fact that we are planning a trip to Florida and it’s pretty hard to keep me away from shopping sites and the Target clearance racks. I’ve put together the following outfit that I’ll be wearing at some point during the Disney Social Media Moms conference and I just love how bright and cheery it is! And here is my plan for the green! I love them both. Each season I tend to gravitate toward variations of the same color. This time it’s all about the turquoise! Bring. it. on. Such a cute outfit — perfection for DSMMoms! LOVE this color, and this outfit! So cute. I’m loving the green this season. 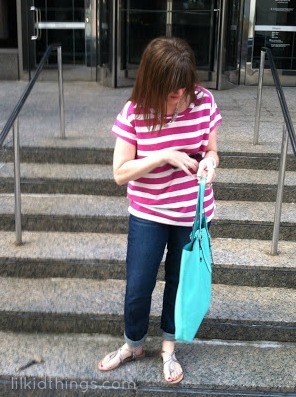 I love that bag, and the pink striped shirt!